The Reading Warehouse is proud to offer Carson-Dellosa products! To best cater to our customer's needs, we require all Carson-Dellosa items to be placed on a separate order. Since all Carson-Dellosa products are processed and shipped separately, please allow 10-14 business days for your items to be delivered. Finally, in order for us to offer you a 25% discount on these items we require a minimum order of $9.90 on Carson-Dellosa items. Annotation: Skill Builders are great tools for keeping children current during the school year or preparing them for the next grade level. A variety of fun and challenging activities provides students with practice and helps introduce basic skills to new learners. 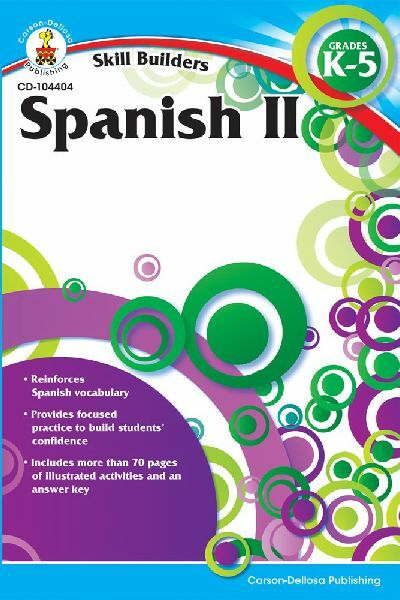 This full-color workbook contains appropriate passages and exercises for elementary Spanish language learners. Skill Builders combines entertaining and interactive activities with eye-catching graphics to make learning and reviewing fun and effective. The compact 6" x 9" size makes this book perfect for school, at home, or on the go. It features 80 perforated, reproducible pages and an answer key.